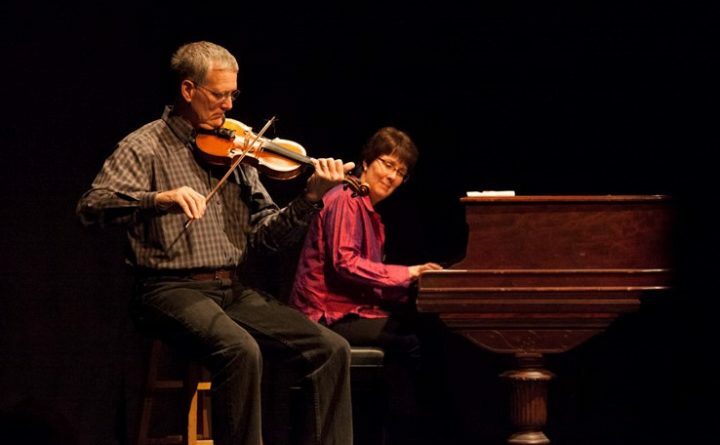 Multi-award-winning fiddler Don Roy and Cindy Roy, a pianist and step-dancer, will appear in concert at Phippsburg Congregational Church on Saturday, April 14, at 7:30 p.m. The married couple’s performances draw from roots deep in the Maritimes and Quebec; a musical passion that celebrates not only the French Canadian tradition but also Celtic music. They perform frequently as a duo and with the Don Roy Ensemble, and have appeared at The Kennedy Center, the Library of Congress, One Longfellow Square, the Champlain Valley Festival, the National Folk Festival, and Celtic Colours in Nova Scotia. Called “the quintessential Downeast fiddler” by Bau Graves, director of the Old Town School of Folk Music, Don has garnered many awards and honors, including three Individual Artist Fellowships from the Maine Arts Commission, given for excellence in the pursuit of traditional arts. He was also presented with the Harold Carter Memorial Award for country fiddling. Like Don, Cindy grew up immersed in the melodies and rhythms of Franco-American music; her grandparents came to Maine from Prince Edward Island. She has been playing piano and step-dancing in the Franco-American tradition since her early years. In 1988, Don gathered Cindy and other family members and friends to form the Maine French Fiddlers. This band took the distinctive Franco-American sound to a national audience, playing iconic venues like Carnegie Hall, Lincoln Center, and Wolf Trap, and appearing twice on “A Prairie Home Companion.” Don led the Maine French Fiddlers on tours through New England and Louisiana. He is also music director of Fiddle-icious, a community orchestra of over 140 members that is now in its second decade. The show will be performed at the historic 1802 Phippsburg Congregational Church, 10 Church Lane (at Parker Head Rd.) in Phippsburg. Admission at the door is $15; students $8. $12 advance tickets available at BrownPaperTickets.com. Children under 8 are admitted free. Doors open at 7 p.m. For more information, call 389-1770.